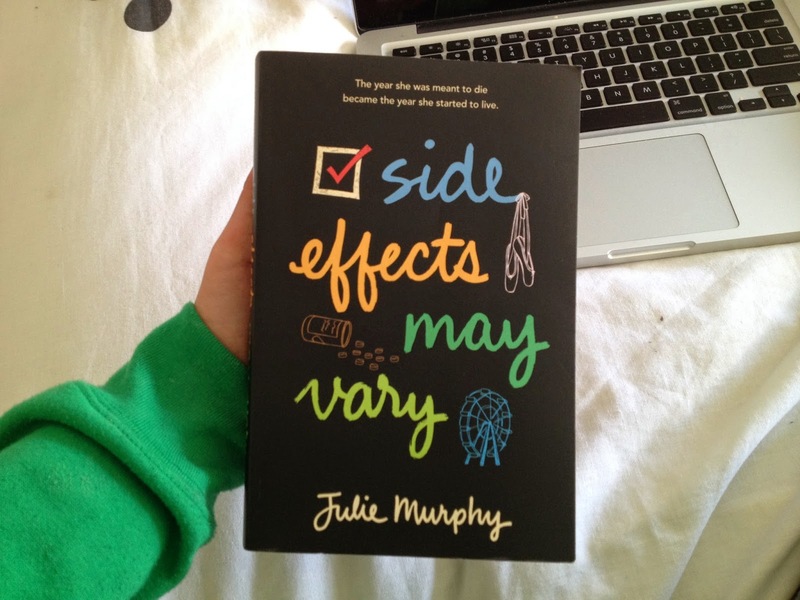 Today I am going to be reviewing one of my newest reads: Side Effects May Vary by Julie Murphy. "What should have been [their] end had become [their] beginning"
When Alice is diagnosed with leukaemia she is told that she doesn't have very long to live. So, she vows to spend her last months, fulfilling a crazy bucket list, full of acts of both redemption and revenge. But, just as Alice finishes settling scores - she goes into remission. Now, she must face the consequences of her actions. Side Effects May Vary was a very interesting book to read. Written from two points of view (Alice's and Harvey's), Murphy wonderfully creates these fully-fleshed characters that are far from perfection, meaning that we can identify their flaws - making it more relatable and realistic. However, I never like to judge characters, because usually I can make a good connection with them, but for some reason, the main character, Alice, annoyed me throughout the whole entire novel. Sometimes I wished I could meet her in real life, so I could give her a piece of my mind. But, despite my random bursts of hatred towards her, Alice was one of the most real and human characters I've ever come across. Julie Murphy did not shy away from showing every character in their truest form, so I felt like by the end of the book, I could see how all the people developed and changed, because there was nothing hidden in these characters. The book is not only written from different points of view, but also jumps from Then to Now. This was very confusing at the start because it didn't flow, but closer to the end, having that transportation from before remission, to after, gave you a quick pan through her entire journey through cancer. This is because Murphy highlighted the most important parts before she went into remission, and then showed us the effects that happened now. So, we didn't have to flick through pages of unnecessary backstory, before we got to the main crux of the novel. This book wasn't a very heavy read, so I devoured it fairly quickly. I did enjoy it, yet because of the fact I really could not bring myself to liking Alice, I didn't feel satisfied at the end. Also, a thing that happens in the first chapter (I don't want to spoil), seems to be important, but turns out it isn't that much of a big deal. This makes that event in the first chapter unneeded, and really the story could've began somewhere else. (but that is just my opinion - I do know other people that thing it was necessary after all).